New coated carbide grade for Heavy Duty Industry. 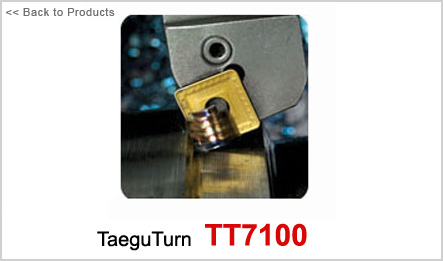 The grade TT7100 has been designed to provide a very tough substrate with a CVD coating. This combination provides an improved resistance to fracture and insert chipping on heavy duty and interrupted cut applications across a wide range of steels and stainless steels. Very tough carbide substrate base - with a CVD coating. This combination provides both excellent toughness and chipping resistance. Tough grade will provide stable cutting conditions on a wide range of medium to roughing applications at low cutting speed.